Mr. Prime Minister, thank you very much. I'm honored to be here with the leaders from Albania, Croatia, and Macedonia. The United States appreciates the leadership you have shown in the cause of freedom. We're pleased Albania and Croatia have been invited to join NATO. And we look forward to Macedonia taking its place very soon in this great alliance for freedom. Laura, who has joined me today, and I are proud to stand on the soil of an independent Croatia. Our countries are separated by thousands of miles, but we're united by a deep belief in God and the blessings of liberty He gave us. And today, on the edge of the great Adriatic, we stand together as one free people. Croatia is a very different place than it was just a decade ago. The Croatian people have overcome war and hardship to build peaceful relations with your neighbors, and to build a maturing democracy in one of the most beautiful countries on the face of the Earth. Americans admire your courage and admire your persistence. And we look forward to welcoming you as a partner in NATO. 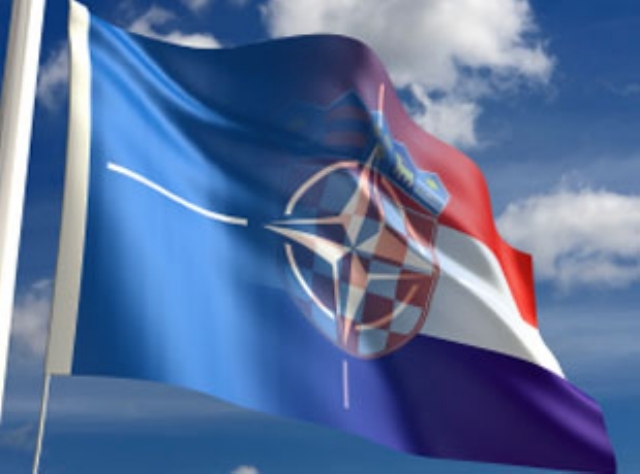 The invitation to join NATO that Croatia and Albania received this week is a vote of confidence that you will continue to make necessary reforms and become strong contributors to our great Alliance. Henceforth, should any danger threaten your people, America and the NATO Alliance will stand with you, and no one will be able to take your freedom away. I regret that NATO did not extend an invitation to Macedonia at this week's summit. Macedonia has made difficult reforms at home, and is making major contributions to NATO missions abroad. Unfortunately, Macedonia's invitation was delayed because of a dispute over its name. In Bucharest, NATO allies declared that as soon as this issue is resolved, Macedonia will be extended an invitation to join the Alliance. America's position is clear: Macedonia should take its place in NATO as soon as possible. The NATO Alliance is open to all countries in the region. We welcome the decisions of Bosnia-Herzegovina and Montenegro to take the next steps toward membership called Intensive Dialogue. And we hope that soon a free and prosperous Serbia will find its rightful place in the family of Europe, and live at peace with its neighbors. With the changes underway in this region, Europe stands on the threshold of a new and hopeful history. The ancient and costly rivalries that led to two world wars have fallen away. We've seen the burning desire for freedom melt even the Iron Curtain. We've witnessed the rise of strong and vibrant democracies and free and open markets. And today the people of Europe are closer than ever before to a dream shared by millions: A Europe that is whole, a Europe that is at peace, and a Europe that is free. The people of this region know what the gift of liberty means. You know the death and destruction that can be caused by the followers of radical ideologies. You know that, in a long run, the only way to defeat a hateful ideology is to promote the hopeful alternative of human freedom. And that is what our nations are doing today in the Middle East. The lack of freedom and opportunity in that region has given aid and comfort to the lies and ambitions of violent extremists. Resentments that began on the streets of the Middle East have resulted in the killing innocent people across the world. A great danger clouds the future of all free men and women, and this danger sits at the doorstep of Europe. Together the people of this region are helping to confront this danger. Today soldiers from Croatia, Albania, and Macedonia are serving bravely in Afghanistan –– helping the Afghan people defeat the terrorists and secure their future of liberty. Forces from Albania and Macedonia are serving in Iraq –– where they're helping the Iraqi people build a society that rejects terror and lives in freedom. It's only a matter of time before freedom takes root across that troubled region. And when it does, millions will remember the people of your nation stood with them in their hour of need. At this great moment in history, you have a vital role. There are many people who don\'t appear to understand why it takes so long to build a democracy. You can tell them how hard it is to put in place a new and complex system of government for the first time. There are those who actually wonder if people were better off under their old tyranny. You can tell them that freedom is the only real path to prosperity and security and peace. And there are those who ask whether the pain and sacrifices for freedom are worth the costs. And they should come to Croatia. And you can show them that freedom is worth fighting for. The great church in this square has stood since the Middle Ages. Over the centuries, it has seen long, dark winters of occupation and tyranny and war. But the spring is here at last. This is an era in history that generations of Croatians have prayed for. It is an era that Pope John Paul the Second envisioned when he came to this land, and prayed with the Croatian people, and asked for "a culture of peace." Today in this square, before this great church, we can now proudly say: Those prayers have been answered. May you always remember the joy of this moment in your history. And may the hopeful story of a peaceful Croatia find its way to those in the world who live as slaves, and still await a joyful spring. May God bless Croatia !! !